“And Israel shall dwell in safety” is the biblical quotation that the Amsterdam rabbi Menasseh ben Israel (1604-1657) used in the first Hebrew book (a siddur) that came off his printing press in 1627. The citation (Deuteronomy 33:28) set the tone for the annals of the Jews in the Netherlands in the three centuries that followed. Menasseh himself was a Sephardi, part of the first wave of Portuguese Jewish refugees to return to Jewish tradition in the Dutch Republic. They were soon followed by Ashkenazi Jews from Eastern Europe, who began to find their way in even greater numbers to the far-famed city of Amsterdam. Although the freedom enjoyed by Amsterdam’s Jews was not unlimited, their position during the Dutch Golden Age of the seventeenth century was remarkable – certainly when compared to that of Jews almost anywhere else in Europe, where persecution, discrimination, and ghettos were commonplace. There has always been something unique about Amsterdam’s Jewish quarter – clustered around the seventeenth- and eighteenth-century synagogues that still stand on Jonas Daniël Meijer Square. During the Eighty Years War (1568-1648), in which the Dutch gained independence from Spain, the Jewish immigrants from the Iberian peninsula were regarded with some suspicion, fueled by traditional Christian prejudice against Jews. But the Protestant burgomasters did not lose sight of the commercial importance of the Sephardim: their international connections and knowledge of languages provided an additional impetus to the city’s economic growth. Meanwhile, a blind eye was turned to the influx of impoverished Jews from Eastern Europe. It was not just a question of economics; the tolerance that marked Holland, and Amsterdam in particular, was also a key factor. Indeed, the citizens of the Dutch Republic enjoyed a considerable degree of religious freedom. A law of 1579 laid down that people could not be persecuted for their faith. For centuries the commercial city of Amsterdam was a haven for refugees of many persuasions; in addition to the Jews, Catholics and Protestant dissenters benefited from the city’s climate of tolerance. Without the constraints of a ghetto or distinguishing dress that were common elsewhere, Jews lived among the non-Jewish majority in the same neighborhoods. 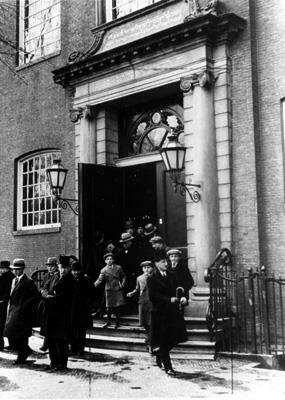 People leaving the New Synagogue in Amsterdam after the service. Photographer: unknown Date: 1930-1940. Jewish Historical Museum, Amsterdam. 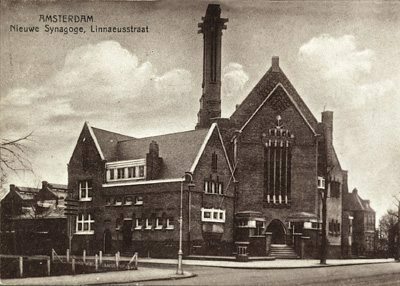 Exterior of the Linnaeusstraat Synagogue, Amsterdam, 1929. Photographer: unknown. Jewish Historical Museum, Amsterdam. Great Synagogue and New Synagogue (now the Jewish Historical Museum), 1987. Photographer: Jeroen Nooter. Jewish Historical Museum, Amsterdam. 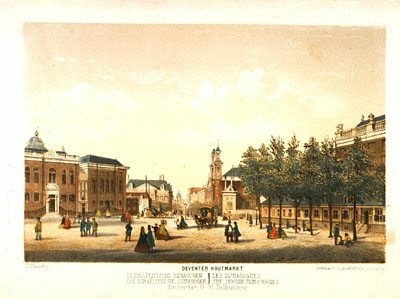 “Deventer Houtmarkt” (Deventer lumber market). On the left, the Great and New synagogues; on the right, the Portuguese Synagogue. Lithography by Willem Hekking, Jr., 1861. Jewish Historical Museum, Amsterdam. A wide gulf separated the wealthy Portuguese Jews from the poor Jewish immigrants from Central and Eastern Europe (Bohemia, Poland, Lithuania) and Germany, who took their name from what had been known in Hebrew since the Middle Ages as Ashkenaz. Although the first Ashkenazi prayer services were held in 1635, an independent community was not established until 1639. This was followed shortly thereafter by the first Ashkenazi synagogues, in houses on and opposite Vlooyenburg (today’s Town Hall – Muziektheater). Since Jews were generally barred from the guilds, most of the newcomers were forced to earn their living as stall-holders in the market, street traders, peddlers, old-clothes dealers, diamond polishers, pressmen, or domestic servants to Portuguese Jews. Jews regulated their own internal affairs and the community leaders – the parnassim – bore responsibility for the indigent. Funds were raised from donations given in return for synagogue honors, from the sale of kosher meat, and, among the Portuguese, from a duty (imposta) on imports. Immigrants were offered grants to encourage them to continue their travels and settle outside Europe. The extent of the poverty only became apparent in the eighteenth century, when Amsterdam’s economy began to deteriorate. By 1800, 36.7% of the city’s population was on relief; 54% of the 3,000 Sephardim and 87% of the 22,000 Ashkenazim depended on charity (at the time, Jews accounted for more than 11% of the population of the city). By 1674 the 5,000 Ashkenazi Jews in Amsterdam already outnumbered Sephardim two to one. Small wonder that their community needed a new synagogue. Elias Bouman (1636-1686) was the architect of the Great Synagogue, inaugurated on March 25, 1671, shortly before work started on the far larger Portuguese Esnoga opposite. These, the first outwardly recognizable monumental synagogues built in Europe, formed part of the cityscape. In 1672 the Ashkenazi community opened its own meat market, with the profits dedicated to poor relief, social institutions such as hospitals, orphanages, and schools, and to the salaries of the physicians who cared for the poor and of the synagogue officials. Today the restored Great Synagogue is part of a complex of four synagogues: the Obbene Shul (1685-1686), the Dritt Shul (c. 1700), and the Neie Shul (1750-1752) with its magnificent dome, designed by Frederik Maybaum (died in 1768). The Holocaust left these buildings with no congregations. Since 1987 they have housed the Jewish Historical Museum of Amsterdam. In the seventeenth and eighteenth centuries, Central and Eastern Europe were the economic and social focus of Ashkenazi Jewry. Until well into the nineteenth century, the Netherlands continued to import rabbis, cantors, and teachers from Germany and Poland. Their language was Yiddish, soon sprinkled with Dutch words. Yiddish translations of the Bible and lavish uncensored editions of Hebrew books found a ready market in Eastern Europe: “printed in Amsterdam” was a high recommendation. But it was not until the second half of the eighteenth century that wealthy Ashkenazi Jews, such as tobacco merchant and banker Benjamin Cohen (1726-1800), a confidant of the stadholder Willem V, were able to rival the cultural and economic prominence of the leading Sephardim. By then, Amsterdam’s 20,000-strong Ashkenazi community was the largest in Western and Central Europe. 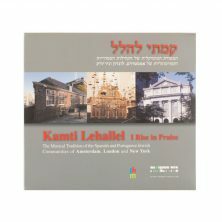 It was around this time that a small but influential group of thinkers began to challenge the authority of the rabbis and parnassim, and traditional Jewish life in general. In January 1795, French troops occupied the republic; “liberty, equality, and fraternity” found their way to the Netherlands as well. On September 2, 1796, following a stormy debate, the National Assembly resolved unanimously to grant Jews full civil rights. In theory Jews could now enter any profession they chose; in practice, even after the guilds were disbanded, in 1809, the process was slow. Most Dutch Jews continued to live in abject poverty. When independence was restored in 1813, the government continued the French policy of limiting the authority of the rabbis and parnassim, the Jewish community was forced to surrender its autonomy, and the synagogues were placed under the jurisdiction of the Ministry of the Interior: the Jewish community had become a recognized religious denomination. The supporters of these changes, like the lawyer Jonas Daniël Meijer (1780-1834), came from the upper echelons of the community. A Dutch translation of the Bible, attempts to enhance synagogue services, and the innovation of sermons in Dutch were all designed to promote the Jews’ integration into Dutch society. These developments received the full backing of the new government after the restoration of Dutch sovereignty in 1813. While in Germany a fundamental debate about the basic tenets of Judaism led to the emergence of the Reform and Conservative movements, no such changes took place in the Netherlands. Still, the renowned chief rabbi, Joseph Hirsch Dünner (1833-1911), a native of Cracow who came to Amsterdam in 1863, attempted to link Judaism with modern scholarship and include the latter in the curriculum of the rabbinical seminary. Abraham Carel Wertheim (1832-1897), a banker, businessman, and philanthropist, may have been on the board of the seminary and chairman of the Jewish community, but he hardly concerned himself with the rules and regulations of Judaism. The liberal Jewish elite supported the separation of church and state. As a result, while Dutch Catholics and Protestants formed their own denominational organizations and schools, Jews made no such advances. Before the Second World War, the number of Jews in public positions was tiny. Only two Jews had ever held cabinet portfolios and only a handful had sat in the Dutch parliament. Outside Amsterdam, which was 9% Jewish in 1930, Jewish aldermen were a rarity. But although Jews were treated with a certain coldness in some circles, the antisemitism that infected Germany and Austria was not to be found in the Netherlands. The existence of a large Jewish proletariat in Amsterdam offered fertile soil for socialist ideals. Many Jews joined the socialist movement. Henri Polak (1868-1943), dubbed the “rebbe” of the Jewish diamond workers, was one of those who persuaded the movement to pursue the parliamentary path; he was among the founders of the Dutch Social Democratic Workers Party (SDAP) in 1894. In 1906, more than 29% of Amsterdam’s working Jews were employed in the diamond trade – the city was a major world center of the industry – where they formed the elite of the Jewish working class. Of lesser status were the textile workers, small shopkeepers, and peddlers. Around 1900 almost 60,000 Jews, more than half the Jewish population of the Netherlands, lived in Amsterdam. In 1916 and 1926 the slums of the old Jewish quarter were finally cleared, thanks to the efforts of the Socialist alderman Salomon de Miranda (1875-1942). Jews gravitated towards new working-class neighbors in eastern and southern Amsterdam. Meanwhile Zionism made many converts in the Netherlands. Orthodox leaders objected both to Zionism and to socialism, managing to alienate both the intellectual elite and the Jewish masses. When Hitler came to power in 1933, Dutch Jews began to feel the consequences at once. Caring for and housing refugees from Germany and Austria became a major concern: an estimated 34,000 of them arrived in the Netherlands between 1933 and 1940. The government left the organization and financing of refugee relief to the Jewish community but required that it put up a guarantee of one million guilders. A tough policy was introduced to stem the growing tide of refugees after the anti-Jewish violence of Kristallnacht (November 8-9, 1938): entire groups were sent back across the German border. The government forced the Jewish community to intern refugees in Westerbork – later used by the Nazis as a transit camp for deportees to the death camps. Except among Socialists, the Jews, and especially German Jews, were increasingly viewed as a problem. The Nazi invasion (May 10, 1940) took the Netherlands by surprise. For Dutch Jews, a tolerated and never-persecuted minority, it came as a crushing blow. The country was placed under a civil administration led by virulent antisemites like Arthur Seyss-Inquart (1892-1946) and Hans Rauter (1895-1949), who quickly introduced anti-Jewish legislation. On October 18, 1940, civil servants and students were required to prove they were not of Jewish descent. On October 22, 1940, Jewish business owners had to register their business. On November 4, 1940, all Jews were dismissed from the civil service. Even the High Court, the country’s supreme judicial body, submitted and approved the removal of its own president, Lodewijk Ernst Visser (1871-1942). Only a handful of Christian leaders and students protested. On January 10, 1941, the Nuremberg race laws of 1935, defining anyone with three racially Jewish grandparents as a Jew, in addition to members of a Jewish community, were extended to the Netherlands. The anti-Jewish regulations were published exclusively in a weekly newspaper – the Joods Weekblad – created for the purpose. Following a skirmish at the start of February 1941, the Germans sealed off the old Jewish quarter. Then, emulating Nazi policy in Eastern Europe, a Jewish Council, composed of the leaders of the prewar Amsterdam community, was established (February 13). In a round-up on February 22-23, 425 young Jews were herded together on Jonas Daniël Meijer Square, before being transported to Buchenwald and Mauthausen, where they were soon murdered. In Amsterdam, the arrest and deportation of these Jews provoked a strike, led by the underground Communist party. Although it was broken in three days, the February strike is now recognized as a true popular protest against the injustice being done to the Jews. From then on, however, the net closed inexorably around the Jews of the Netherlands. On June 3, 1941, compulsory identity papers were issued: Jews’ were stamped with a large J. On May 1, 1942, Jews were forced to wear a visible badge: a yellow star with the word Jood (Jew). 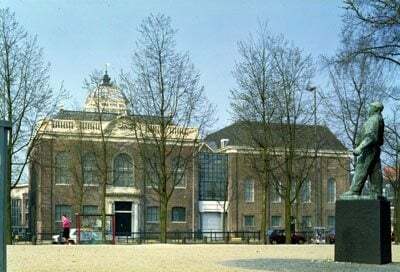 A few months later, the Nazis turned the Hollandsche Schouwburg theater on Plantage Middenlaan (where Jewish artists had been performing for exclusively Jewish audiences) into a collection point for Jews en route to the Westerbork transit camp. Between July 1, 1942 and September 13, 1944, a train of sealed cattle cars departed Westerbork every Tuesday morning, each taking an average of 1,000 to the death camps of Auschwitz and Sobibor or to Bergen Belsen and Theresienstadt. Of the nearly 80,000 Jews living in Amsterdam in 1941, barely 15,000 survived the war, in hiding or in concentration camps. Of the 140,000 Jews in the Netherlands at the start of the war, fewer than 30,000 (21%) were alive at its end. Only in Eastern Europe were survival rates lower than this. In general, the attitude towards the 5,500 who returned from the camps and the 16,500 who had survived in hiding (the remaining survivors included those who had fled to Spain, England, and Switzerland and partners in mixed marriages) was far from sympathetic in the postwar years. They were long confronted by indifference and a lack of understanding. Fortunately, the vestiges of antisemitism soon disappeared. Jews re-entered public life; more were appointed to senior government posts than had served in all the years between 1815 and 1940. Amsterdam has even had four Jewish mayors. Public religious life resumed as soon as the war ended. Amsterdam’s Ashkenazi community, which today has around 3,000 members, worships in eight synagogues. Despite its small size (around 500), the Portuguese community still manages to hold services at the Portuguese Esnoga. Both are traditional Orthodox communities. Since 1966, the re-established Liberal community of around 1,200 members also has its own synagogue. Amsterdam’s wider Jewish community – some 15,000 strong – is small, but diverse. It allows Jews living in the city to live a Jewish life, to take pride in their unique Jewish heritage, and to feel secure in their continued existence in Amsterdam – which happily has never lost is attraction for newcomers. 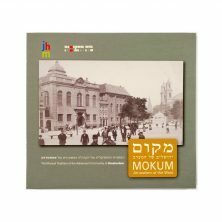 For both old and new Amsterdammers, the city is and remains Mokum (from the Yiddish for “place”) – the place to be.